Steve Bonin of EZ FX, Inc. demonstrates his new EZ FX Slider at NAB2013. Steve Mims is a writer, director and cinematographer based in Austin, Texas whose award-winning films have screened widely in festivals, theatrically and on television. 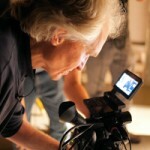 He is the winner of the Innocence Network’s 2012 Journalism Award for INCENDIARY: THE WILLINGHAM CASE, a documentary he co-produced and directed with Joe Bailey, Jr. Steve earned a Master of Arts in film production from the University of Texas at Austin and over the years has been a film lecturer there. He currently teaches RTF366K: Introduction to Narrative at UT. He also teaches through Austin FilmWorks. His feature film ARLO & JULIE (shot on the Canon C100) comes out in May, 2015.